Landau did it his way on AGT. Only one critical performance to go on America's Got Talent for the four finalists. Three acts produced standing ovations from the audience and all three judges. 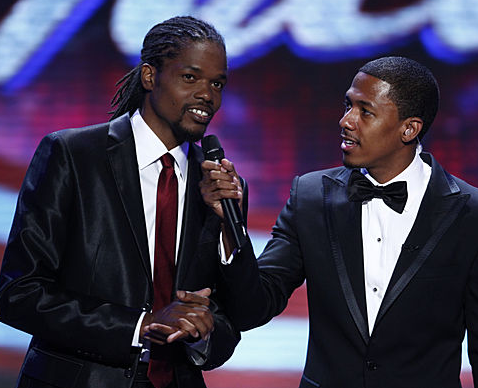 One act was a little flat on the America's Got Talent finals - Tuesday, September 13, 2011. Landau Eugene Murphy Jr. (Singer - Logan, WVA) Singing Frank Sinatra's greatest song, My Way, Landau could not have been more on. He performed with such passion, it brought everyone in the house to their feet. Piers, "What a moment for you. That was a million dollar performance." Sharon, "It gave me goosebumps. It was perfect. Howie was the most enthusiastic, "There is a real good chance you sealed the deal." Wednesday night, Landau will perform a duet with Patti Labelle. Team ILuminate (Technology/Dancers - Los Angeles, CA) Every week the light-up dancers have bested their last performance and they did not disappoint on Tuesday night. With a show that seemed to cover the entire stage and even had some dynamic overhead action, they brought the crowd to a rousing standing ovation. Sharon was bubbling, "This act with your technology, creativity and someone with a vision. You're amazing. You create everything from zero." Howie, "This is spectacular." Piers, "You're what America needs right now. In hard economic times, you create a business, it prospers, it creates jobs. You're exactly what America needs." POPLYFE (Pop Band - Oakland, CA) Tearing into Queen's We Will Rock You, Kehlani got a little carried away with the moment and hit some off notes. Then, they downshifted to We Are The Champions, and she seemed to gain control. Although, when the high notes had to be hit, she wasn't quite hitting them. Near the end of the song, one of the male background singers was way out of key. And none of this went unnoticed by the judges. Howie, "You were a little off." Piers, "There are no losers at this point. You're all winners and have great futures ahead of you. But some of the performance was a bit shaky." Sharon, "Kehlani, you are a star and you can bank on that." POPLYFE will be performing Wednesday night with Stevie Wonder. Silhouettes (Shadow Performance Art - Denver, CO) Performing to Louis Armstrong's classic, What A Wonderful World, the huge troupe of boys and girls delivered a flawless performance. What they do is spectacular, however, we are starting to get an idea what to expect from the shadows. I'd love to see them live for an hour, but there was nothing that made you stop and take a deep breath. Their excellence brought the entire room out of their seats, including the judges. Piers, "We saved the best for last." Sharon, "How inspirational and emotional." Howie, "We loved it. Vote, vote, vote." Between performances, there was a video of the finalists going to Las Vegas to see the showroom at Caesars Palace, where the winner would perform their headlining show. A Las Vegas icon, Terry Fator, performed ventriloquism. And a highlight reel of the seasons craziest moments played right before Silhouettes. Now it's all up to America. There will be four very nervous acts holding their breath for Wednesday night's results. And so will we, waiting to see who will be crowned the winner of America's Got Talent Finals - Tuesday September 13, 2011.